Close of Challenges for the 2008 Rolex Commodores' Cup was on Monday 26th May. The result: 6 nations and 15 teams, two up from 2006. With the weeklong competition commencing on 29th June, team managers are putting final touches to some of the combinations and continuing the process of honing skills. 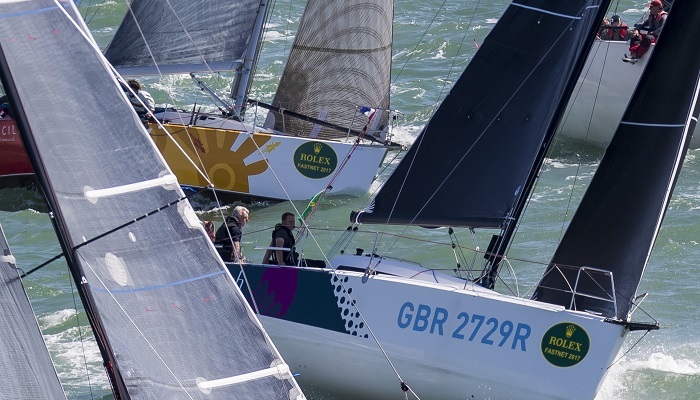 Event Organisers, the Royal Ocean Racing Club (RORC), are understandably delighted with the increase in interest. The participation of Spain and Hong Kong is extremely positive and, alongside the strong, multiple challenges from Ireland, France, The Netherlands and the UK, bodes well for some intense action on the water. Following a review of the 2006 event, RORC has instituted some changes to the racing format, introducing a round the Isle of Wight course as part of the offshore component and making a double-points inshore course the last race of the series. RORC Commodore David Aisher was quick to express the club's deep satisfaction with the level of Challenges and anticipates a tight contest that will be decided on the last race, "with Challenges received from 6 countries for a total of 45 boats we are delighted that the Rolex Commodores' Cup has once again proved itself attractive to top level amateur sailors. The number of entries is a solid endorsement of the revised format event. With the last race being inshore and carrying double points it should take the competition right to the wire!" Aisher will undoubtedly be taking even more of an interest in the competition this year and may suffer from divided loyalties. Aisher has chartered his J-109 Yeoman of Wight to the Hong Kong team. Yeoman is the former Jeronimo, which was part of the winning GBR Red team in 2004. Another of the Hong Kong team's steeds subject to possible split-loyalties is its Class 1 entry, the Grand Soleil 44, Holmatro. Holmatro also competed in 2004 under the Dutch flag. In case anyone is in any doubt about the origins of the crew of these two yachts, the strict nationality requirement in place at the Rolex Commodores' Cup demands at least 50% of the crew are from the nation represented. Another cap placed on the crew element is the number of professionals allowed to take part. Classes 2 and 3 may only have one pro onboard, whilst Class 3 is allowed two. Selecting where these individuals fit within the crew structures is an important part of the decision-making process. For Hong Kong, Scotsman Ian Budgen has been seconded to Holmatro as tactician, Budgen brings with him both inshore and offshore experience at the highest level, having competed in the America's Cup and Volvo Ocean Race. He also brings a third key element - local knowledge. Professionals are not just limited in number, there are restrictions on what they may do. For example, an amateur has to helm throughout the inshore races and the start of the offshore races. The four-team British Challenge is offering up an interesting first for the event. The Army Sailing Association's brand new Archambault 40 racing yacht - British Soldier - is the first services yacht to be selected for a Rolex Commodore's Cup team. She is probably also the first entrant to be launched in some considerable style. British Soldier was officially named and launched at Fort Blockhouse in Gosport on 9 May by the Lord Lieutenant of Hampshire, Mrs Mary Fagan, with the ASA's Admiral Lieutenant General Sir John Kiszely KCB MC in attendance. The ceremony closed with a fly-past by the Army Air Corps' helicopter aerobatic display team, The Blue Eagles. Full details of the teams comprising these Challenges will be posted to http://rorc.org/comcup/index.php and http://www.regattanews.com/ shortly. The Rolex Commodores' Cup will be held off Cowes, Isle of Wight, from 29th June to 6th July 2008.